Absolutely love this chandelier! It looks gorgeous in our formal living room- perfect addition to our modern farmhouse décor! We actually ended up replacing the bulbs as they were way too bright. We used Edison bulbs and added a dimmer switch. 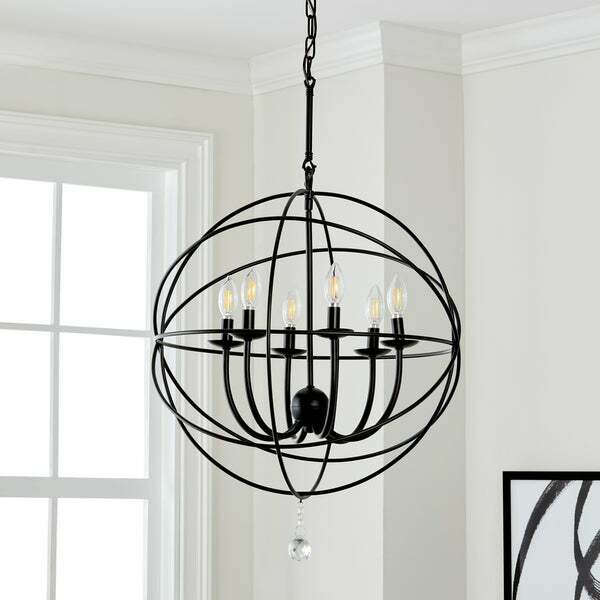 A masterpiece of metalwork, this contemporary matte black chandelier is a favorite of architects. Inspired by the graceful movement of Foucault s pendulum, its curves are paired with the clean lines of the classic candelabra. Ideal for any modern space. Dimensions 22" x 22" x 36.5" - 108.5"
I love this Light!! Perfect for a 16x16 room or bigger. The crystal adds just enough bling. The instructions were easy to follow and made installation a breeze. I am definitely very much in love with this light above my dining room table. I did end up adding a few more jewels to the light pieces and it looks amazing. I Definitely recommend this light if your looking for simple but large fixture. Very pleased with this chandelier. Quick to put up and it looks sooo nice in our dining room. Contemporary and stylish. Very nice for the price and the crystal on the bottom gives the right amount of feminity. We had looked for a long time for the perfect light to go above our dining room table. When we found this we found it. This light looks great it gives off just the right amount of light. I would purchase this light again. This came in a huge box, but not too heavy. We purchased this after looking at 100's of chandeliers for our 20' foyer. Many were not long enough or large enough to make a statement, this however was perfect. Purchased all new lighting for our main floor and this one looks amazing in out dining room. Was easy to install and is just the right size. Absolutely love this chandelier! Got it yesterday and my husband put it up today. The size is perfect for our two story foyer. Comes with the bulbs. "Is this dimmable and LED compatible?" This item comes with 25W C26 bulbs, and it has an on/off switch mechanism. "Hello, what is the voltage of watts on these bulbs?" I just received my chandelier today and the included bulbs are 60 Watts. "Hello, my current chain is 49 inches long. This is adjustable, but how long is the chain?"